Week 4 has two natural contrarian picks: Pittsburgh over Minnesota (61% win probability for Pittsburgh but only 39% of the people picking them) and Detroit over Chicago (59%, 35%). Not as good as last week‘s contrarian picks, but pretty good nonetheless. Another interesting choice this week is Seattle with only a 57% probability over Houston, but with 79% of the people picking Seattle. Week 3 saw my team take 3rd place in the Yahoo Pick ‘Em league. It makes me feel better that my dad took first place based off two upset picks, Bengals over Packers and KC over Philly. When I asked my dad if he used my strategy, he proudly said he went by gut feel. It also helped that he’s a die hard Cowboys fan and picked them for 14 points. I love having Thursday night games… it just makes us do my Yahoo PickEm picks earlier! It’s like football never ends… which I guess isn’t a bad thing. 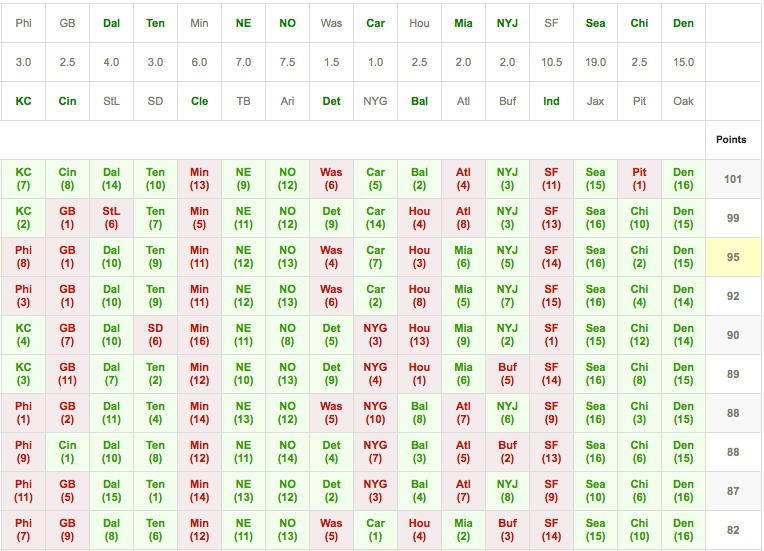 For Week 3, there seem to be a bunch of good contrarian picks. I must admit, they do seem counter-intuitive to me. Miami favored over Atlanta? Carolina over the Giants? But the people who make the lines in Vegas have a lot more incentive to get it right than you and me, and it gives us the advantage in a Yahoo Pick em league.